– Bon Appetit has always done special events around campus with flair. Besides making sure the food is just right, the staff pays attention to the details of decoration and presentation. The staff must have had a lot of fun participating August28 at the Taste of Montgomery County on the grounds of the Lew Wallace Study. 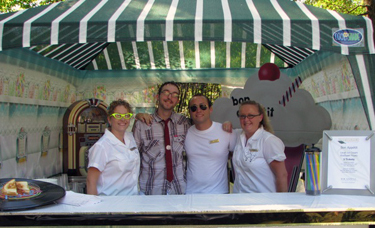 Decked out in 1950s clothing and with a booth dressed up as an old-fashioned soda fountain, the campus caterer took home several of the event’s major prizes. 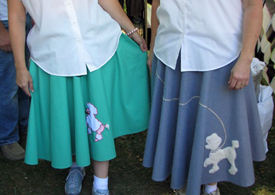 The ladies even had their poodle skirts! Bon Appetit won the judge’s choice award for showmanship and the people’s choice award for showmanship. And don’t thing that’s a fluke because it was the third straight year Bon Appetit won the popular vote! The booth was also named best overall vendor for the food fest. Bon Appetit served up Local Root Beer Floats with vanilla ice cream from Swiss Connection, Clay City, In., and regional root beer from Sprechers, Glendale, WI. They served up Gourmet Grilled Cheese with Fair Oaks Farms Gouda and Sheridan, Indiana’s Homestead Growers’ tomatoes and onions. Many believe blogging or keeping a journal was part of the early stages of social media. 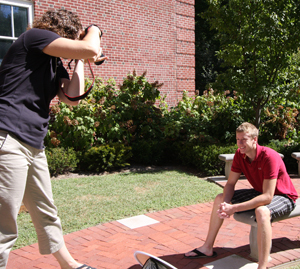 Wabash is entering its fifth year of presenting student bloggers. Around here we like to say “Wabash Men Speak for Themselves” and no where is that more true than in our blogs. Unlike some colleges and universities we do not edit student blogs. Sure, we give them guidelines and choose the young men carefully. But we urge them to be honest – to write about the good days and the bad. Each year Admissions and Information Technology send the incoming class a marketing survey to evaluate the tools we use in recruiting. The students are asked about the blogs, which ones they read, and how often they read them. And we ask if they would be interested in becoming a freshman blogger. We were really surprised by the numbers the first year but not any more. We get an average of 50 young men express initial interest. We follow up with a fairly detailed questionnaire to help us make our decision. About 15 of those 40 will return the questionnaire then Chip Timmons and I will interview 4-6 to make the final selection. We’re not looking for anything more than a young man interested in sharing his first year story, a commitment to the job, and some enthusiasm for Wabash College. We want them to tell the whole story. We don’t select them to be cheerleaders but they are our best ambassadors. We don’t edit them like a classroom English paper, though we’ve been known to correct a few words spelled incorrectly. What you read on our student blogs is honest, blemishes and all! We will largely allow the students to introduce themselves in their first few blogs, but here is a brief look at our 2014 crew. Scotty Cameron ’14 is from Rushville, In. with a big interest in technology. He graduated from Rushville High School with academic honors. He hopes to write for the Bachelor and join the Glee Club. Those on campus will recognize him from the little black hat he wears most days. John Decker ’14, LaPorte, In., doesn’t usually wear a hat but he is easy to pick out of a crowd. The Little Giant tennis player is about 6-foot, 8-inches tall. The affable young man is interested in Education and Political Science. Back in LaPorte he was a tennis instructor, Cadet Teacher, Hoosier Boys State Delegate, and captain of his high school’s lacrosse team. Steven Hinojosa ’14 is from Harlingen, Texas. Steven follows several southern Texas men to Wabash College. Steven plans to major in chemistry and has a big interest in music. 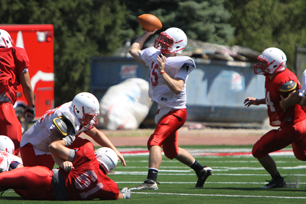 He got excited about blogging and Wabash while reading sophomore Ryan Lutz’s blog last year. Bradley Wise ’14, Monroe, GA., is also a long way from home but is part of the Wabash swim team family already. Bradley and his twin brother Scott went different directions for college but the Georgia native is quickly embracing Wabash traditions. He was an outstanding student at Social Circle High School, active in his church, and swim team activities. Each of the young men will be blogging 2-3 times a week. Following the freshmen bloggers is a great way to learn about life at Wabash College. Jim Amidon — I walked across the Wabash College campus Friday morning so I could check up on the progress at Hollett Little Giant Stadium. Various crews have been working to install a new synthetic playing surface, scoreboard, and give the 44-year-old stadium a facelift. All those soaking thunderstorms in June slowed the progress of what was already a pretty tight timeline. As of mid-day Friday, there was still a huge pile of white sand and several large containers of granulated rubber still to be applied to the Field Turf surface. Wes Chamblee scores on a long run in Saturday's scrimmage. Somehow, though, the crews got finished enough so the Little Giant football team could take the state-of-the-art surface for a test drive Saturday afternoon in a little offense vs. defense scrimmage. After all these years hanging around Wabash’s football program (28 this year), very little surprises me any more. But the transformation of Hollett Little Giant Stadium ranks up near the top. I have always been proud of Wabash’s facilities. Hays Hall is a state-of-the-art science building; Trippet Hall is a beacon at the north end of campus; the Fine Arts Center is one of the finest of its kind for a school our size; and renovations of Goodrich and Baxter halls create ideal teaching and learning conditions. The Allen Athletics and Recreation Center, dedicated less than 10 years ago, provides 170,000 square feet of space for intramurals, recreation, and the varsity sports of basketball, swimming, wrestling, and indoor track. It’s a stunning building for a college of any size. 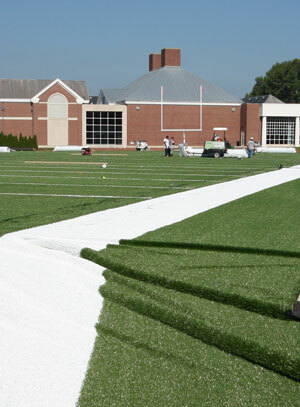 Over time, though, the College’s outdoor athletic facilities didn’t match up with all the other improvements to campus. You can still see the overflowing dumpster in the corner of the stadium. Crews were still working just a couple of hours before the Red vs. White Scrimmage. For over 50 years, Mud Hollow has been the all-purpose green grass area of campus, home to the baseball team in the spring and the soccer team in the fall. The football team practiced there for decades. In comparison with many schools against which Wabash competes (for students and in sports), the baseball and soccer facilities were, in a word, shabby. That’s not meant to knock the hard work coaches and groundskeepers have put into the baseball and soccer fields. They’ve done remarkable work, especially considering that Mud Hollow is by a large measure the lowest part of campus, which makes for mucky conditions in the spring. It’s my job to hype up all things Wabash. The new football field needs no hype. One look says it all. 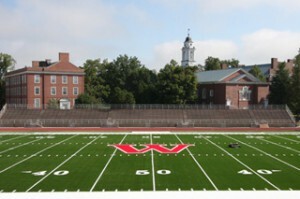 The Field Turf is a deep, lustrous green with bright red Wabash lettering and a bold W in the center of the field. It will never need to be watered or painted or fertilized. It will reduce injuries to players. It will be gorgeous year-round. And I can’t wait to see what it looks like in November when HDNet broadcasts the Monon Bell Game in high definition! The transformation of Hollett Stadium is just the beginning. The baseball stadium construction is well underway on the southwest side of campus. When I drove by last week, I saw the massive piles of dirt being spread to level that part of campus for the baseball field. There’s a tall post stuck in the ground near the corner at Jennison Street; that’s where home plate will be. I decided to get out of the car and check it out. It was a pretty cool feeling to stand at home plate and imagine what the new stadium will look like when it opens in March. Baseball Coach Cory Stevens works as hard as any recruiter at Wabash, and he’ll soon have a showpiece stadium to match his efforts. Finally, as soon as the soccer season ends, workers will begin the long process of leveling Mud Hollow Field, which slopes to the south by about four or six feet from one end to the other. Once they get it level (talk about moving a lot of dirt), the crew from Field Turf will return to put down a synthetic soccer field, which will be the first step in the construction of a new soccer stadium on the western edge of Mud Hollow. The rest of Mud Hollow will be a combination of synthetic and natural grass practice and intramural fields. By this time next year, all of the construction on new outdoor athletic facilities will be complete. 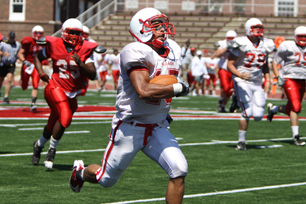 A little over 40 percent of all Wabash students participate in intercollegiate sports; over 80 percent play intramurals. A year from now, all will enjoy outdoor facilities that match the high quality of the classrooms, laboratories, art galleries, and concert halls. I hope you’ll plan now to share our pride in Wabash and attend the Community Day football game against Wooster on September 11. Admission is free and believe me, there is no finer place to watch a football game any where. Howard W. Hewitt – Wabash freshmen go through a pretty intense five days of orientation upon arrival but they get to cap it off with a fun event at the President’s home. President Patrick White and his wife Chris hosted the 255 men of the Class of 2014 Wednesday evening for ice cream dessert and a look at the Elston Homestead. For the freshmen it caps several hectic days the evening before classes begin. It’s also a chance to shake the President’s hand, make more new friends, and have a little fun. Jim Amidon — August 25 — The Field Turf crew installing the new playing surface at Hollett Little Giant Stadium is entering the final phase of work. On Tuesday, the crew began spreading tons and tons of fine white sand, over which they spread billions of pieces of granulated rubber. See pictures from Tuesday afternoon here. Two separate trucks were in the process of spreading granulated rubber Tuesday afternoon. The process looks a bit like spreading fertilizer on your lawn — but using a fertilizer spreader on steroids! After one layer of sand was spread, in came tons of tiny rubber specks. 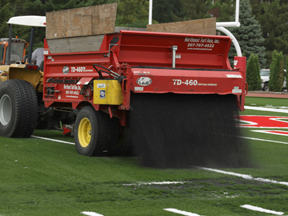 Once the rubber is spread, another tractor with a large agitating brush goes over the field, sideline to sideline, to work the rubber into the sand, even out the particles, and help the material settle as deeply in the turf as possible. While the Field Turf guys are doing that, another crew is resurfacing all of the Owen Huntsman Track elements, including the approach area for the high jump at the west end of the stadium, and the long jump and pole vault runways on the south and north sides of the field. Work could be completed as early as Wednesday, but is likely to continue through Thursday. The Field Turf guys like to let the materials settle for several days before players take the field. Given how magnificent the new surface looks, keeping the guys off it could be a tough task for Coach Raeburn and his staff. A view of midfield at Hollett Little Giant Stadium with the new red "W" now in place. Work continued over the weekend on the FieldTurf at Hollett Little Giant Stadium. Matt Sanchez and his crew shaved and glued the giant — and I mean giant — red “W” at midfield Sunday morning. Today the crew will finish gluing the red “WABASH” logo in both endzones before starting the infill process. Once the sand and little black rubber pellets are in place and the finishing touches are applied over the next few days, the field will be ready for the 2010 Little Giant team. View photos of progress at the stadium here. Work is progressing on the new baseball stadium, as well. A marker is in place to designate home plate and four cement bases for the backstop have been poured. Both the first base and third base dugouts have also been defined, and will be slightly below field level. A photo album of the baseball stadium progress will be posted by Tuesday morning. With the arrival of the freshmen class, the finishing touches nearly complete at the football stadium, and classes set to start Thursday morning, the 2010-2011 school year is underway. 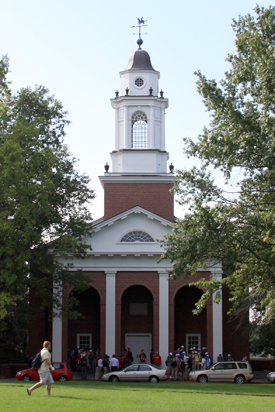 Howard W. Hewitt – We are near the completion of a successful migration to a new software platform for all Wabash College blogs. The blogs are all back up today and readers will notice the wider format and cleaner look to the blog pages. Recent posts are easier to find in the right hand column. For our Wally Bloggers on campus the new software – WordPress, for those into such things – allows more options in posting, dating, the way we present photos, and other options we didn’t have previously. For example, notice the photo I’ve inserted here. There is descriptive information beneath the photo instead of buried at the bottom of the page. That is a small thing, but a convenience for readers. We still are having a few technical issues that Director of Technology Brad Weaver, Monica Brainard and the good people in Tech Services are working out. But we really like the new look and think regular blog readers will enjoy the wider format. The wrinkles remind the average observer that Field Turf is a lot like carpet. – Work continues in the stifling heat at Hollett Little Giant Stadium. Workers have been laying turf down around the main playing field which is covered. One of the more noticable highlights will be the coaches’ box and side field lines which are a bright white. Workers were laying turf on the visitor’s side of the field Friday morning with the other three sides yet to come. See photos shot Friday morning here. Matt Sanchez, the project foreman for Field Turf, said Monday the project takes about 14 days. After five days of progress, it’s easy to see how the labor-intensive project takes that long. The field hash marks have to be cut and sewn in along with all of the lettering. Field work behind the Allen Center at the baseball field seem largely concentrated on drainage Friday. Workers made steady progress Tuesday on turf installation. The five-yard strips of turf continue to go down. The hash marks and numbers, field lettering all go down after the turf is in place. Check out the photos for a close look at how the pieces are sewn together. There’s also a couple of shots from the continued drainage work at the new baseball field. Click here. Steve Charles—Returned from vacation to find that last week we lost Captain Ron Thomas ’76—U.S. Navy (Retired), husband, father, and a man of faith. I don’t know how he died, and I can’t begin to fathom why. On the website carrying his obituary a chaplain who had served with Ron when he was Captain of the U.S.S. Essex (LHD 2) wrote: "He was a fantastic boss and role model. He will be sorely missed." In my third year as editor at Wabash I had the pleasure of interviewing Ron, soon after he took command of the U.S.S Anchorage in 1997. We titled the article "Commanding Respect," but "inspiring admiration" might have a better headline. The two-page feature showed the Anchorage on one page, and Ron with his wife, Cleo, and sons Matthew (then seven) and Marc (then four), on the other. "You have to make the most of your time together. There’s no greater joy you can get at the end of a hard day than to have the boys run out before you can even get the seatbelt unbuckled and want to be close to you. And you can imagine what that’s like when you’ve been gone for six months! There’s sacrifice, but there’s joy as well. "You do these things to try to keep your family together, and you pray and keep your faith strong." "If I had to say there was one thing that Wabash gave to me that my contemporaries didn’t get from whatever school they went to, it would be that rule. It has to do with leadership—it forces you to operate based on your own personal character as opposed to a set of rules. A person has to look at that one rule—carry yourself as a gentleman at all times—and ask, ‘What does that mean?’ To me it means that your own personal integrity is worth far more than a whole bunch of rules. It’s your own personal integrity that’s going to make the difference in your life." We have lost about as good a man as you are likely to find.